April 05, 2019 / April A.
Preheat oven to 350 degrees. In a large mixing bowl combine sweetener, butter, cream cheese. and eggs. Cream together. 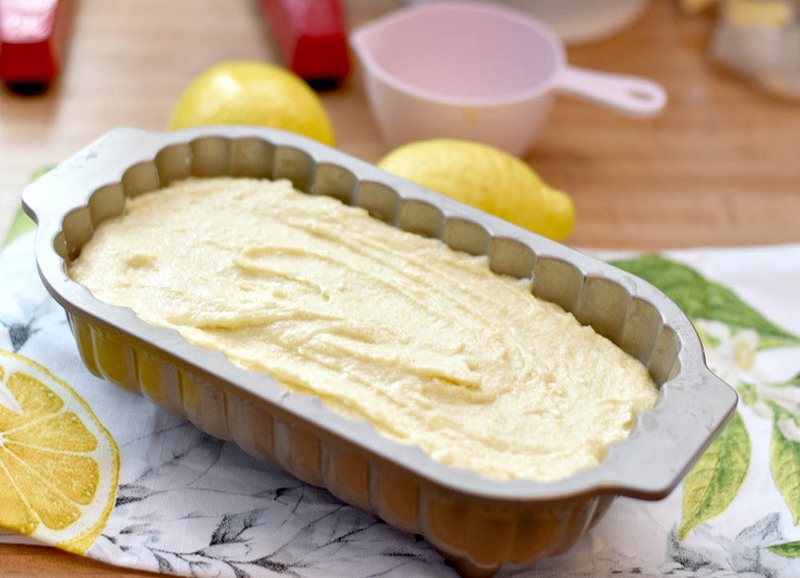 Add vanilla, lemon juice, lemon zest, salt, and baking powder mix until combined. Then add almond flour. Grease a loaf pan. I use this coconut oil spray. Add batter to pan and bake for 35 min and test. The side will slightly pull away for the pan when done. 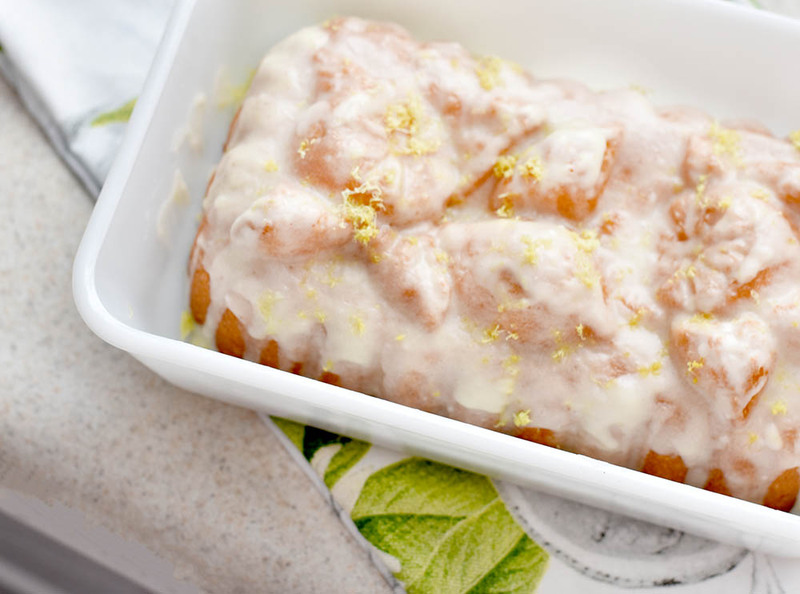 Once cooled mix together ingredients for glaze and drizzle over the top of your cake. It’s such a delicious moist lemon cake! March 02, 2019 / April A. When I was growing up my mom made us a special treat each year. It was always one of my favorites. It was her White Chocolate Coconut Jelly Bean Candy Easter Nests. I just love how the white chocolate, coconut and the fruity flavors of the jelly beans mixed so well. With this flavor combination in mind I came up with a new Easter tradition our Easter Cake. As I thought about the flavor of the jelly beans Kool-Aid came to me. Kool-Aid comes in many different shades of bright colors, it has similar flavors and some of our favorite jelly beans so it was the perfect solution to both coloring and flavoring each layer of our Easter Cake. Our Easter Cake has a pink strawberry, yellow pineapple, green lemon-lime, and blue mixed berry layers. It is frosted with the most delicious coconut white chocolate buttercream frosting. Combining the coconut and the flavors remind me of a colada drink. This is a great cheery cake for kids. Divide the cake batter equally into 4 medium mixing bowls. Slowly add Kool-Aid powder until you reach the desired color and flavor or each color. Bake each cake color layer in an 8 or 9 inch round cake pan for about 18-20 minutes check after 18 minutes. 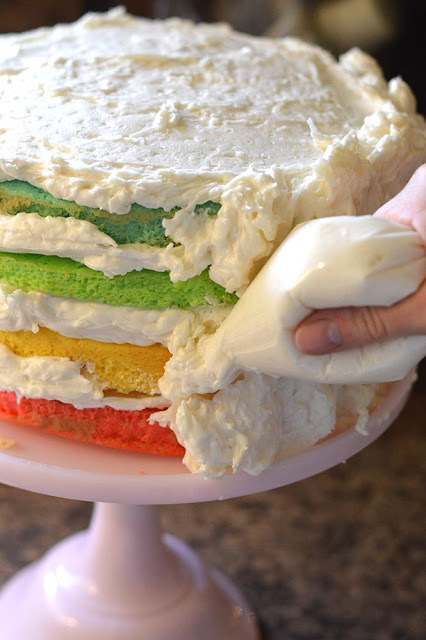 The cake will bounce back when done when pressed down in the middle with your finger. Cool for 5 minutes then remove from pan and completely cool on cooling rack. Wrap each cake layer in plastic wrap and place in freezer. In a stand mixer using the whip attachment whip together melted white chocolate, butter, milk, vanilla and about 1/2 cup of the powdered sugar to incorporate air. This will make your frosting nice and light and fluffy. Slowly mix in the remaining powdered sugar then add coconut and whip together. This frosting is creamy, delicious and sets up very nicely. Add coconut and 1/2 packet of Kool-Aid powder to zip top bag. Mix the coconut and powder together kneading with hands. Mound in the center of the top of the cake to form a nest top off with a large handful of jelly beans. SWEET TIP: To frost the cake and get beautiful layers add your frosting to a quart size zipper top bag. Snip of one corner of the bag about a half inch up. Starting with the bottom layer squeeze our large dollops of frosting around the cake top. Spread evenly and repeat as you add each layer. Then squeeze out frosting in a zigzag pattern around the side of the cake. Spread over the sides filling in between the zigzag. Don't worry if you zigzag is straight. The point of this is to get a fairly even amount of frosting around the cake so it is easier to spread and prevent little cake crumbs from mixing into your frosting. If you have any holes in your frosting just go back and add another dollop of frosting. This frosting sets up nicely and is very forgiving. Since it is a coconut frosting it doesn't have to be perfectly smooth. The kids are going to LOVE this cake.